In the spirit of Women's History Month, I would like to speak about Greta Thunberg. She is a 16-year-old Swedish climate change activist that has started a trend, but unfortunately, the news of the global climate change protest was overshadowed by a horrific act of terrorism. 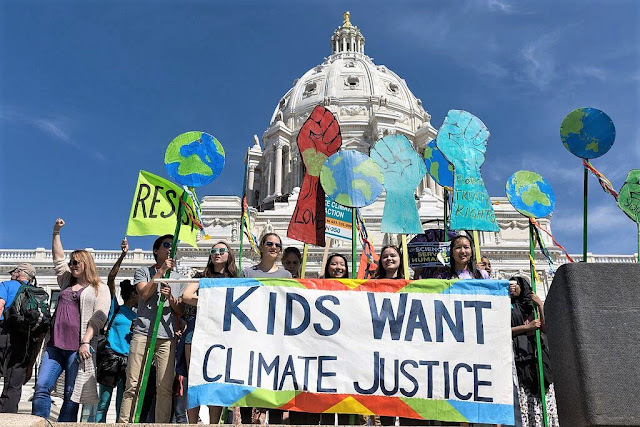 However, on Friday, March 15th, 2019, millions of grade school, pre-teens, and teenagers marched in protest for the future of our planet. Their generation will face the most devastation from climate change and they would like us to do something about it now. The kids are right! Politicians and many businesses are more concerned with their bottom lines than making changes that would help with climate change. They choose to make up excuses like " many jobs will be lost" this is a lie. More jobs will be created by becoming more green. Of course, it will take money to make these changes, but I have a feeling the money is there and we need to put it to good use, not golf trips, expensive curtains, desks, tables. Think of all the wasteful spending we don't know about. We could be doing so much more for the greater good with our tax dollars. The way of the future is wind and solar power. It is already happening and although some people may not be happy with locations of solar farms or wind farms they will continue to pop up. What is the Woodford County Board doing to bring us into a greener community? We really must plan for and think about the future. How can we use this as an opportunity to do better/more than our parents? Why aren't we finding new and innovative ways to recycle one-time use materials? We need to do more. Thank you to Greta for speaking up and doing what you can to help out. Thank you to all the kids and adults who participated in the protesting. Thank you to all who are standing up and doing what is right!